Holocaust Memorial, Earl Bales Park, Toronto. After Sandra and I were married in 2009 we settled in a roomy two bedroom apartment in a low-rise red brick building in Toronto’s North York. Even though our home was almost right on the continuously busy Highway 401, we quickly grew fond of our new neighborhood. Sandra’s sister Judy and her family lived downstairs and were often game to explore our new stomping grounds. Indeed, walking became a hugely pleasurable activity for us in the two years that we lived in North York. Avenue Road was steps away from our front door and delightfully vibrant. Teenagers, families with babies in strollers, well-dressed middle aged couples, and many other people coursed up and down its long, wide sidewalks visiting charming restaurants, boutiques, and a particular used-bookstore that was wonderfully cramped with shelves full of books. The streets that intersected with Avenue Road turned into tree-lined avenues where many a residence dated back to the early years of the last century. The odd grove of fruit trees reminded passersbys that long ago the region was dotted with farms. On nearby Wilson Avenue, which cuts through Avenue Road, we found Temple Sinai, an unassuming building set back from the street with a cordon of grass and trees. Planted into the lawn, several colorful signs from the United Jewish Appeal Federation asked us to support Israel and the future of our children. We began to understand not long after discovering Temple Sinai that our new neighborhood was home to the local Jewish community. We would come across symbols of the faith and its people in places like our apartment building where a number of doorframes displayed mezuzot, little scrolls inscribed with ancient biblical text from the Torah. Walking past them on my way to work or upstairs to meet Sandra, I often reflected on their role as a link to an ancient tradition of faith. In my first post in this series I alluded to my Polish background. While I am culturally Catholic, shopping in Jewish bakeries that sold challa bread or eating in restaurants that served latkes and cream to lunch time crowds on weekends and closed for holidays such as Pesach, I never felt like an outsider. I am not Jewish and yet as a Pole I cannot help but feel a bond with Jewish culture. The history of Poland and the Jewish people is tightly intertwined and dates back in time about 1000 years. Bagels, kasha, kreplach and other Jewish dishes, I know personally because they are also a part of Polish cuisine. The Hasidim men in their heavy long coats and large round hats who walk along Bathurst Street on some days trace their history in part to 18th century Poland. The history of Poland therefore is the history of the Jewish people and I would argue mine too. It includes horrific violence fueled by anti-Semitism as well as long periods where Jews from across Europe settled in Poland to live in relative peace and freedom. On the Bathurst Street entrance to Earl Bales Park, a ten minute drive from our apartment, Sandra and I stopped at the Holocaust Memorial on a dark and somber January afternoon in 2011. Not one other person was around. 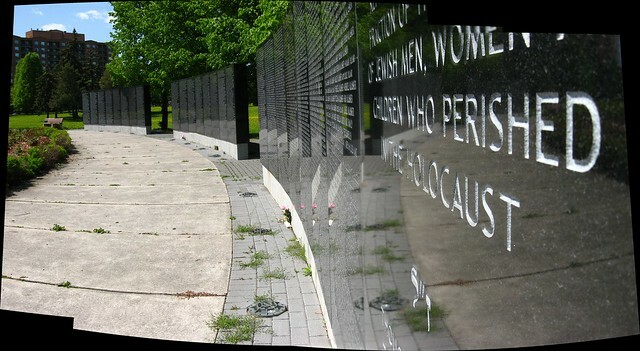 The memorial resembles a towering flame and is surrounded by a wall of remembrance, filled with row upon row of names of people who confronted unimaginable suffering. Sorrow and mourning gripped our hearts as we slowly walked along the wall and remembered. The generations of Jewish people in Canada and across the world who lived after the Holocaust and those who are still living demonstrate that with the mourning for loved ones who perished, life, goodness and culture stand triumphant. In Toronto, Jewish culture certainly continues to thrive. Post by Piotr Rajchert. Photo Credit: Flickr/Lone Primate.